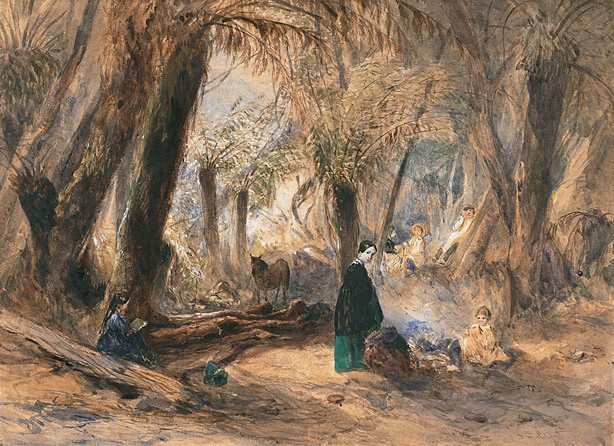 John Skinner Prout's compositions were firmly grounded in English picturesque taste and his practise of drawing 'en plein air' influenced those with whom he came in contact in New South Wales and Tasmania, leading to a spontaneous and naturalistic way of depicting the landscape, an antecedent to late nineteenth-century Impressionism. Prout's compositional simplicity, economy, cool colouring and the spontaneity of his watercolour technique place him far in advance of most of his colonial contemporaries. 'The artist's wife and children, Hobart' depicts Prout's wife and large family picnicking along the banks of the Hobart Rivulet shortly after their arrival in Tasmania in 1844. Signed and dated l.r. corner, brown ink "J S Prout/ 1844". 19th century Australian watercolours, drawing and pastels from the Gallery's collection , Sydney, 2005, 42 (colour illus.). The dictionary of Australian artists: painters, sketchers, photographers and engravers to 1870 , Melbourne, 1992, 645 (illus. ).